Thelma passed away peacefully at 96 years of age with her daughters by her side. She was residing in Salem Manor Nursing Home in Leduc, Alberta. As usual, she decided when it was time to leave. Thelma was born in Kelwood, Manitoba on April 20, 1922 to Caroline and Ivo Osman, and moved to Alberta when she married Ross Hay in 1949. She was a loving mother of five children. 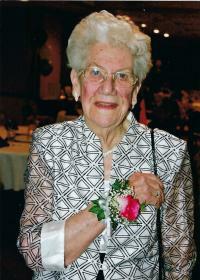 Thelma began her career as a teacher at a boys’ school in Winnipeg, MB, then later taught in a one room school house. When she moved to Alberta she taught elementary to high school grades. At 65 years Thelma learned computer skills and worked until retirement at 70 years, at which time she became instrumental in the formation of Heritage Senior Centre in south Edmonton. She loved to cook, travel, have a good cup of coffee, watch sports, was quick to laugh and had a witty sense of humor. Thelma is survived by her daughters Judith Gill (Abe), Mihalee Bennett (Rob), and son Douglas Hay; many grandchildren, great grandchildren, nieces and nephews. She was predeceased by her sisters Peggy and Phyllis, and brother Ken; daughter Glenda and son Terry. She will be missed by those whose lives she has touched. The family is grateful to the staff of Salem Manor who cared for her with great affection, dignity and respect. There will be a Celebration of Thelma’s life held in the spring. In lieu of flowers, donations may be made to the Alzheimer’s Society.